3M Window Film can do more than shield you from high energy bills. They can help protect you from unwelcome events like hurricanes, severe storms, terrorism and vandalism. Below is a brief summary of the various Safety and Security films we offer, which can be applied to glass doors, windows, or skylights. Up to 42 micro-layers make 3M™ Ultra Series films totally unique as well as tough and tear-resistant. This film delivers superior performance over standard polyester films in blast and impact events, yet still maintains a high level of optical clarity. Ultra Series films can also be combined with many 3M™ Sun Control Films to give you the best of both worlds. The video to the right demonstrates 3M™ Ultra 600 with and without an adhesive attachment: Ultra 600 3M Window Film stands up to even bomb blasts and protects building occupants. 3M Ultra Prestige is non-metalized and offers all the benefits of Sun Control with safety features built in. It blocks heat and reduces hot spots and damaging UV rays, while also helping to hold the glass together in the event of breakage. The ultimate in high technology, combining 28 micro-layers of strong, tear-resistant Ultra safety 3M Window Film with the added advantage of Prestige Series sun control films. Designed not to change the appearance of your building, allowing up to 70% of the visible light through your windows. Blocks heat and reduces hot spots by rejecting up to 97% of the sun’s infrared rays. 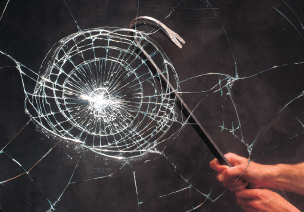 These clear, single-layer polyester films have a special thicker adhesive to hold broken glass together. 7 and 8 mil polyester films offer basic protection. Paired with a special thicker adhesive to help hold broken glass together. Available in clear safety or with a tinted sun control option. To the right is a video clip that was featured on Fox 26 News Hurricane Briefing. It is a live demonstration of 3M Safety & Security films’ ability to withstand hurricane damage. Protect your home and office from flying glass and debris! 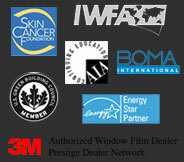 4 mil single layer clear 3M Window Film offers good basic protection. 6 mil multi-layer clear 3M Window Film offers increased protection for higher risk areas. Offers an invisible sacrificial layer to protect glass from acid etchings, scratches and tagging. Can also protect other glass surfaces from wear and tear. This unique window protection system combines the toughness of 3M™ Ultra Safety and Security Films with an adhesive or profile attachment system. Choose either 3M Impact Protection adhesive or 3M Impact Protection Profile depending upon your frame and overall aesthetic goals. This combination system attaches the film to the window frame, creating a robust shield that consistently outperforms window film-only systems. It’s extra assurance against impact energy from severe weather, earthquakes and forced entry events—with enough strength to handle even bomb blasts. Bonds the filmed glass to the frame with either an adhesive or profile option. Attachment system offers the highest level of protection—strong enough to protect occupants against bomb blasts. Creates a robust glass protection system that significantly outperforms film-only installations.